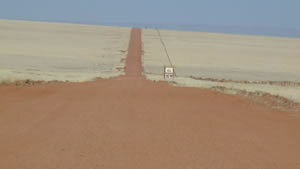 Crossing the border from Angola to Namibia was like entering another planet - the roads were fantastic, the utilities all worked, the shops had almost anything you could want and there were no queues for diesel.There were no facilities for money changing at the border crossing so we motored on to Utapi and stopped at a roadside picnic spot for one of our usual sandwich lunches. No hassle by or interest in us from local children which was strange but welcome. Our night's stop was at the Oshakati Guest House which proved to be a lovely treat after a few nights camping, not too expensive, beautifully clean and well appointed. Their restaurant food was excellent so we decided to make our stay 2 nights and have a day relaxing, re-stocking, planning and enjoy some retail therapy in the South African brand shops such as Shoprite, Mr Price, Game, Truworths, Exact etc. Amazingly, we met Jens (see Angola page) and his wheelie suitcase, heading for Johannesburg and his flight back to Germany, in the restaurant of the Oshakati Guest House, still as fresh and smiley as he was in Benguela and full of his travels. 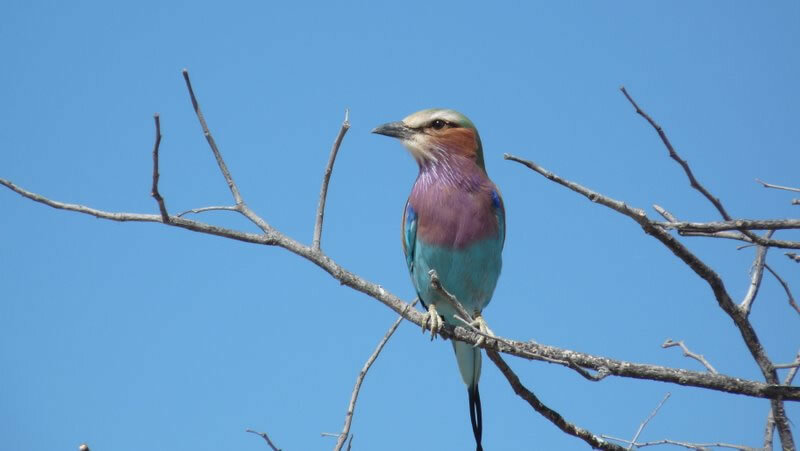 Off to Etosha National Park - On our way in to Namutoni Lodge we saw plenty of game - more than we had seen in Lope National Park. Our first encounter was with a huge solitary bull elephant ambling its way along the road towards us. Not aggressive in any way just a little annoyed that we were on its roadway. It did get a little spooked and move off into the bush when both Berwyn's 'blackberry' and our mobile phone went off simultaneously - thanks for the call Philip - timing not great but lovely to hear from home. The only lodge with camping space was Halali Lodge so we pitched up there - incredible shower blocks with lovely hot water and camping pitches with braai, electricity plug-ins and lights. Namibians/South Africans really know how to camp in style. We were pitched next to a very jolly group of Capetonians who had brought everything you could possibly think of including a 'well stocked drinks trolley'!! Since southern Angola the nights have been getting increasingly cold and our first night camping in Etosha was decidedly chilly. Having set off in the heat of Ghana we were not really prepared for temperatures reaching single figures so on went the one and only sweatshirt that we each had. Needless to say, we managed, but decided that after two chilly nights at Etosha and one at Roy's Camp north of Grootfontein, where we enjoyed Oryx steaks (great) and a fabulous Aubergine Moussaka, we would head for Rundu at the beginning of the Caprivi Strip (Namibia's Pan Handle) and buy some fleece blankets,before continuing on towards Botswana and Chobe National Park. 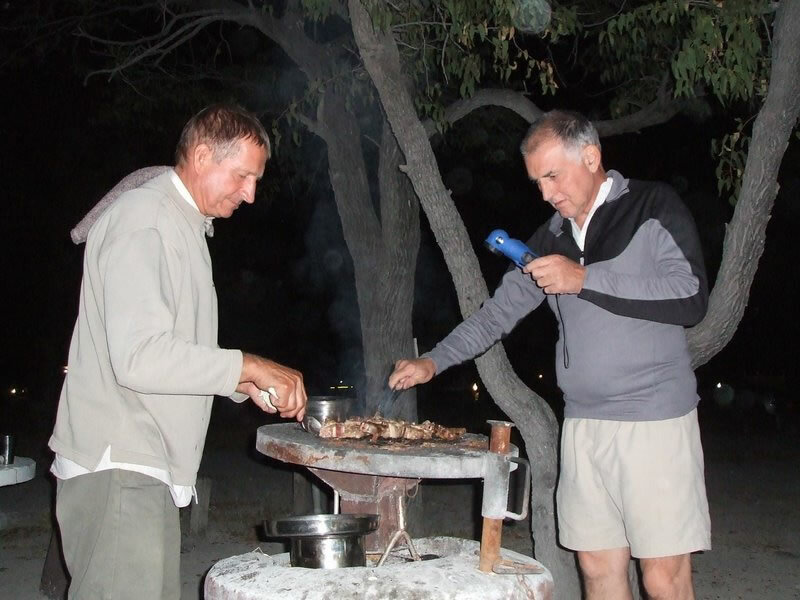 Rundu was a really busy town with everything that you could want; we bought a gas stove to replace our charcoal cooker and, in the Forget - Me - Not cafe, bumped into two Dutch VSO's, Fiona and Karin, both working in Nambia - a small world. 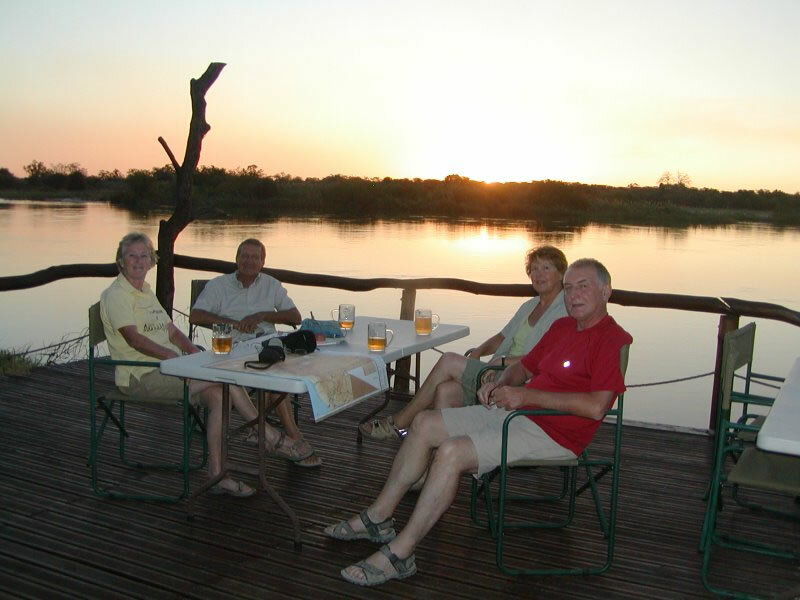 Next stop was a great campsite at Nunda Lodge on the banks of the Kavango River; we put our feet up whilst B & J went off to explore Mahango Game Park. The campsite was very well run with super ablutions, in the middle of which was a lovely garden! Here we also said goodbye to our faithful coalpot which was now no longer needed. 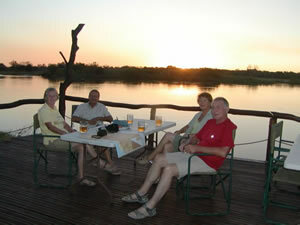 Our next camp was Nambwa in the Caprivi Game Park. With Berwyn at the helm and evening rapidly approaching, we had a very scary drive through the forest on 13 km of deep sandy tracks - running the gauntlet of countless families of elephants, it was a very unnerving journey and we were most relieved to finally arrive at the camp - well done Berwyn! Nambwa had more excitement in store for us; no sooner had we gone to bed than elephants came crashing through the camp, only 10 feet away from our tents, munching the branches. Plenty of noise from hippos throughout the night too. Julia slept through it all, much to her disappointment!! Our drive out of Nambwa was not without it's heartstopping moments. Despite having Berwyn's 'Garmin' to show us the routes, we managed to leave the camp on a different , lower track than we had come in and soon found ourselves faced with a 'river'crossing. Mitzi literally took the plunge, took a bit of a heart-stopping nose dive halfway across, a bow wave sweeping up over her bonnet, before coming back up and making it to the other side. Mitzi might not be good in deep sand but she can certainly swim! 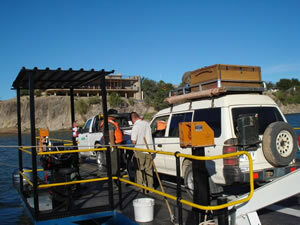 Back onto a good tar road, we set off for Ngoma and the Botswana border. It was not getting any warmer at nights so when we stopped at the Tutwa Tourist Information centre near Katima Mulilo for lunch and information, we also bought a couple of fleece jackets. After a superb visit to Botswana, we crossed back into Namibia to an enthusiastic welcome from the border officials at Buitepost; we enjoyed an overnight stay at Eastgate Rest Camp before heading off once again on the dead straight, wide, Trans Kalahari Highway to the big city lights of Windhoek. We needed to visit the Namibia VSO office in Windhoek: to pick up an insurance document, to meet Daan, the VSO Namibia Country Director and to give Mitzi a well deserved overhaul. Earlier on our travels we met Yvonne, who ran the Vondelhof guesthouse in Windhoek, conveniently close to the city centre, so we decided to look her up and stay for couple of days. We arrived in Windhoek late Saturday morning only to find that almost everything shuts down at 1.30 for the weekend! True to form however, we managed to find a good lunch time restaurant - The Gourmet - to which we returned twice during the weekend! Windhoek was pretty cold - not surprising as it is about 5,000ft above sea level and surrounded by hills. The guest house provided hot water bottles and as there was no form of heating in the rooms we resorted to keeping warm in bed with the said HWBs, writing up our blog and watching rugby on TV before it was time to go out for our evening meal. Sunday saw us taking a much needed walk round Avis Dam, a popular local spot for fishermen, runners/dog walkers etc. As this was Michael's birthday we also managed to Skype him and the family in the evening. A real treat to be able to phone home!! 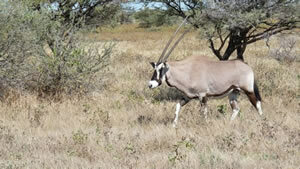 Windhoek is an attractive, well organised and prosperous place, we hadn't seen so many shops for years. On Monday we found the VSO office; Barney, their driver, took us to H & I Motor Repairs where 'Ingo' the proprietor gave Mitzi a good overhaul, and changed oil, fuel and air filters. He also found that Mitzi had a broken leaf on one spring and wrecked shackle bushes all around, which he duly replaced. Mitzi's hospitalisation delayed us another day in Windhoek so on Tuesday morning we were very pleased to be on our way again. Leaving Windhoek the scenery rapidly changed as we drove through wide open spaces, past large grey mountains, through the 'Remhoogte Pass', to wide open flat golden grasslands bordered on each side by rocky red mountains, with the occasional reddish petrified dune to the west. 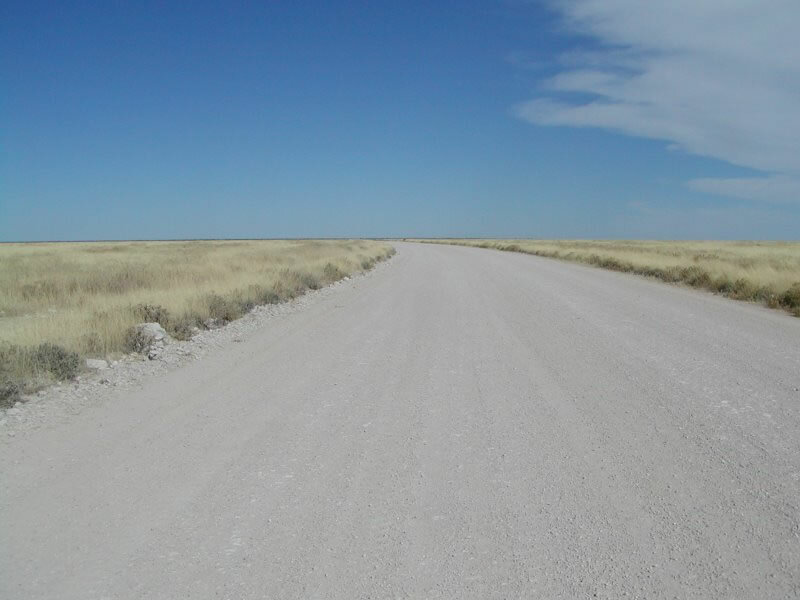 It was on this journey that we came to really appreciate the quality of all of the roads in Namibia, especially the off the beaten track 'D' roads upon which we so often drove. 'Gary the Grader' is a Namibian (not the only one) who drives a Grader that keeps even the most remote road in almost pristine condition; he also tows behind him a trailer which serves as his mobile home. 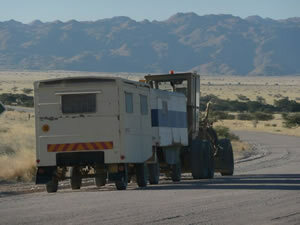 The distances are so huge in Namibia and the roads run through some of the remotest and hostile (arid) territory imaginable, thus 'Gary' has to work from 'home' by towing it behind him; every now and again he does get a break to return home - well done Gary (our name for him), we really appreciated you! We eventually arrived at Sesriem camp site and were allocated Camp 9 - in the shade of a huge Camel Thorn tree - the best site on the camp. Alarms were set for 5am ready for a 62 km dash/drive to Sossusvlei Pan to watch the sun come up over the sand dunes and to climb to the top for the stunning views and interesting colours and shapes of the dunes; the Namib Desert boasts some of the largest dunes in the world. Back to camp for a late breakfast and lazy afternoon. We also visited the nearby Sesriem Canyon, a spectacular 1 km gash in the desert, before returning to camp for a 'sundowner' and another of our great braais, this time fuelled by Camel Thorn nuts - they burn great, you should try them!. 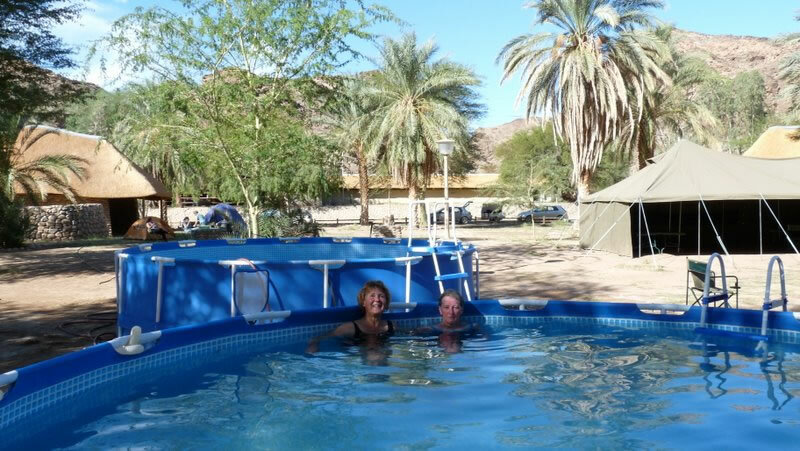 The Namtib Biosphere was recommended to us by Daan in the VSO Office in Windhoek, we are so grateful as it was a real highlight for us. From Sesriem we drove for hundreds of kilometres through dry savannah grassland and endless mountain ranges until we finally turned to head straight for a cleft in the Tirasberg Mountains. After driving gradually uphill through 12 km of grassland, populated mainly by Oryx, (the area had recently experienced the most rainfall for 27 years) we entered a working 'homestead' in the bosom of the mountains. We enjoyed our first mountain walking for months in the warmth of the Tiras, spending most of the day to get to the summit, stopping to admire the Quiver Trees and the plethora of flowers, plants and shrubs that were interspersed between the dramatic rock formations on the mountain and the river valley behind the farm. Braised Oryx steaks for supper and a very sociable evening with Thorsten and Linn lulled us into staying for an additional night (we then enjoyed Springbok Goulash); Namtib will remain with us in our memories as a very special place; we did eventually set off, somewhat reluctantly, for Fish River Canyon. 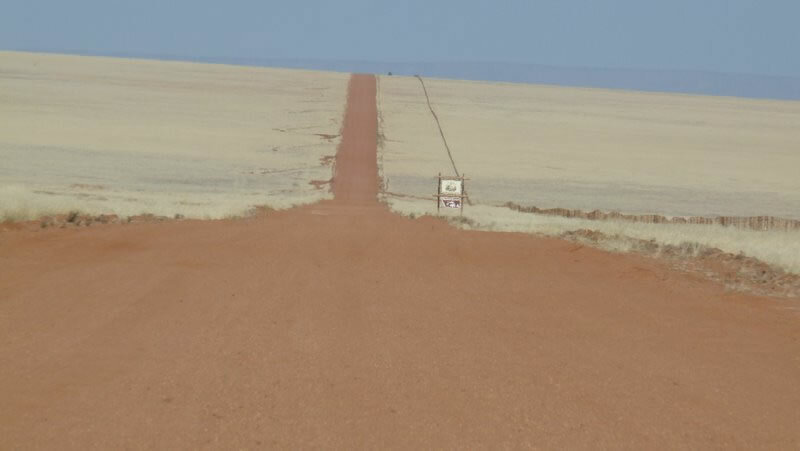 From Namtib we once again drove for hundreds of kilometres through the most amazing scenery (vast escarpments and seemingly endless, empty, remote roads) before taking an 8 km diversion to Aus to re-supply with camping food and to re-fuel Mitzi. Aus was absolutely freezing due to a cutting wind blowing up from the Atlantic 123 km away; we vowed that there was no way that we were going to camp if it was as cold as that at Fish River Canyon! Aus was quite an interesting place, it was the location of an Internment Camp for Germans during the First World War; sadly many of its prisoners and guards died from the cold! 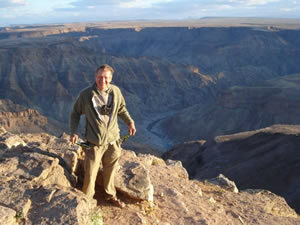 On arrival at Hobas, Fish River Canyon (supposedly the world's 3rd largest), it was much warmer than Aus, so we did camp. 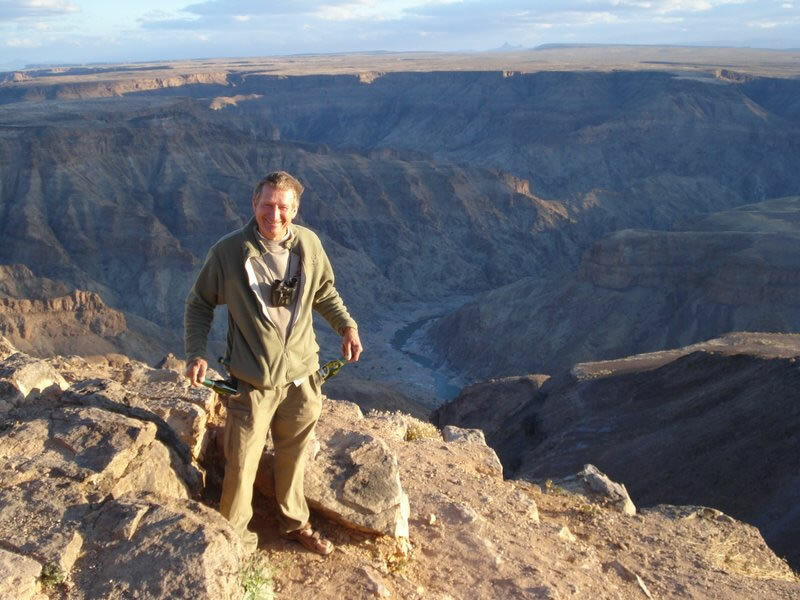 We set off to visit the nearby Canyon and were very impressed by its scale and grandeur; we imbibed a sundowner whilst enjoying the view in the evening sunlight and then, thanks to Berwyn's culinary skills, we enjoyed another superb Braai of steak and chicken back at the camp. The next day took us down to the south end of the Canyon at Ai-Ais; experienced walkers can take an 80 km 5 day walk down the Canyon but we were not geared up for that - so we drove. Ai-Ais benefits from thermal springs issuing from the Canyon (as did Julia and Jenny) and has been developed as a Spa; it was being upgraded whilst we were there, thus we did not experience it at its best.We did however enjoy, by the camp fire, the company of Vogn and Lynn from Capetown (Vogn manages a South African style, thus - active, retirement village in Somerset West). 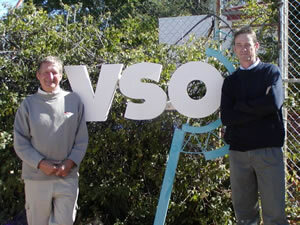 Vogn gave us some good tips, for which we were very grateful, for our journey back into South Africa the following day. 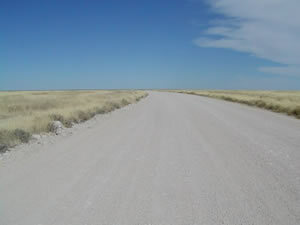 Leaving Ai-Ais we traversed what can only be described as a 'moonscape', with the gravel road winding and snaking its way through desolate open plains, up, over and around rocky hills and outcrops, sometimes only just wide enough for Mitzi to get through. 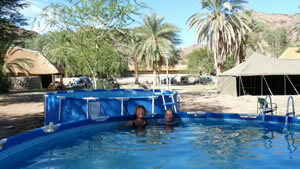 We eventually came to the Orange River, a jewel of sparkling blue, a surprising sight in such an arid landscape. Its source is in Lesotho, 1200 kms away to the east. We followed it on its way to the sea, occasionally leaving it to go round the back of some great mountain of rock only to rejoin it 5 or 6 kilometres further on. There were a number of small diamond mining companies along the river bank but it seemed to be a pretty hard and lonely existence. We needed to make a small detour and headed for Rosh Pinah, a zinc mining town fairly close to the Namibia/RSA border; we visited the ATM for some Rand, the local Spar for provisions and had a Wimpy brunch . Back on track once more we reached the Orange River and at Sendelingsdrift we crossed on a 2-car pontoon from Namibia into South Africa. 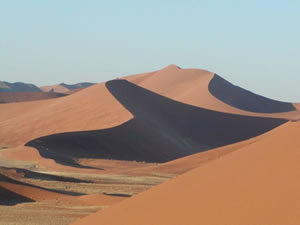 One cannot overstate how absolutely spectacular the landscape is in Nambia: endless mountain ranges, vast dry arid deserts, the snaking, rolling red sand dunes, vast areas of open savannah grassland, the huge Fish River Canyon, and by contrast the beautiful, crystal clear waters of the once diamond laden Orange River bordering South Africa. Highly recommendable. Gary the Grader - working from home!